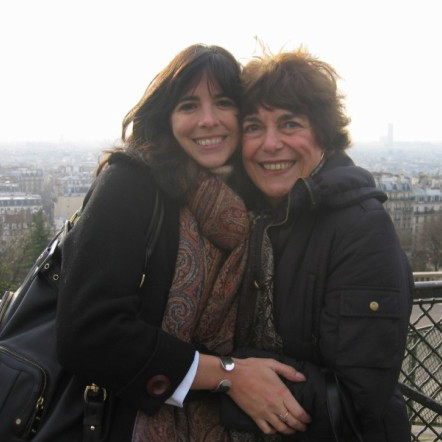 In 2009, Isabel González Whitaker succeeded in getting the Westside park renamed in honor of her late mother. Now, it will feature a renovated playground, open field soccer area, and a "learning nook." Isabel González Whitaker stands outside the park named for her mother. 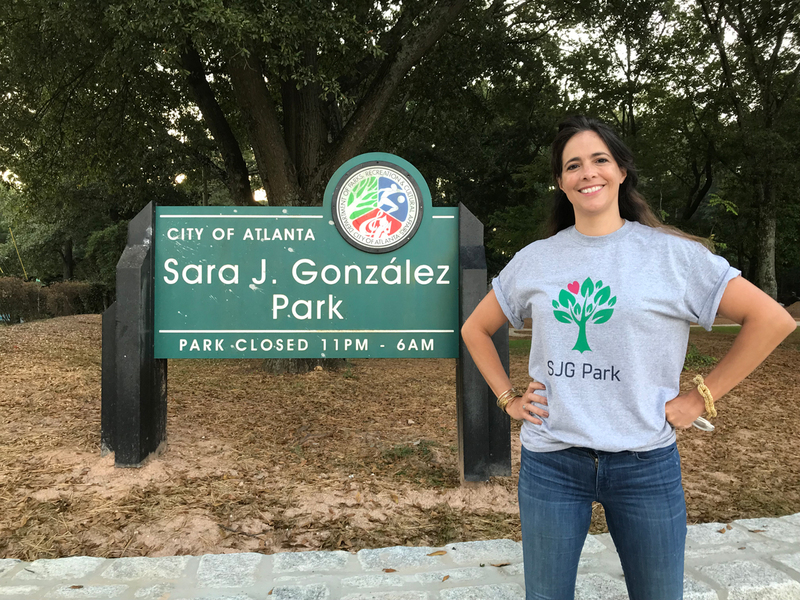 In a ceremony on October 9, Mayor Keisha Lance Bottoms will lead the rededication of the Westside’s Sara J. González Memorial Park, the first park in Georgia to be named after a Hispanic person. Behind the charge of renaming the park after this leader in the Georgia Hispanic community is her youngest daughter, Isabel González Whitaker. Following her mother’s death in 2008, Whitaker wanted to memorialize her in some way, and when the park, located between Coronet Way and Bolton Road, became available for renaming in 2009, she saw an opportunity. With the help of the city of Atlanta and Ralph De La Vega, now the vice-chairman of AT&T, Whitaker moved forward with the project. Previously called Coronet Way Park, the urban playground is located across the street from her family’s former Cuban restaurant and down the street from where her mother lived for 30 years. “It is reflective of my mother’s legacy,” says Whitaker. In the years after the renaming, Whitaker led a committee to redesign the park and manage volunteer clean-up and work days. Now, based on the community’s feedback, Whitaker and her team have given the park a second life as an ADA-compliant family greenspace. The Sara J. González park now hosts a renovated playground, an open field soccer area, a legacy plaza, and a “learning nook” area that will offer educational programming, thanks to Georgia Power Foundation and feedback from a local ESL teacher. Aside from honoring her mother’s love for children, Whitaker knew that dedicating a park with better community resources would be the right legacy for González. According to the Hispanic Federation, only 19 percent of Hispanic children across the country have access to recreational spaces close to their neighborhoods. Cuban-born Sara J. González immigrated to the United States shortly after Fidel Castro took power after the family started receiving death threats. Following a divorce, González made her way to Atlanta via Miami with her two children and second husband Fernando in the 1970s. González “cultivated a voice for the community around advocacy, fundraising, and development” while working at the immigrant-focused nonprofit, Whitaker says. Her efforts paid off as former Atlanta Mayor Shirley Franklin recruited her to help liaison with the Hispanic community leading up to the 1996 Olympic games. Her mission to help immigrant entrepreneurs also helped her transition into her position as CEO and President of the Georgia Hispanic Chamber of Commerce. During the next 12 years, she would advocate for Hispanic business leaders and employees and moved to create the Hispanic Caucus at the Georgia State Capitol, along with political candidate forums to give Hispanic politicians a larger platform to speak about their issues. 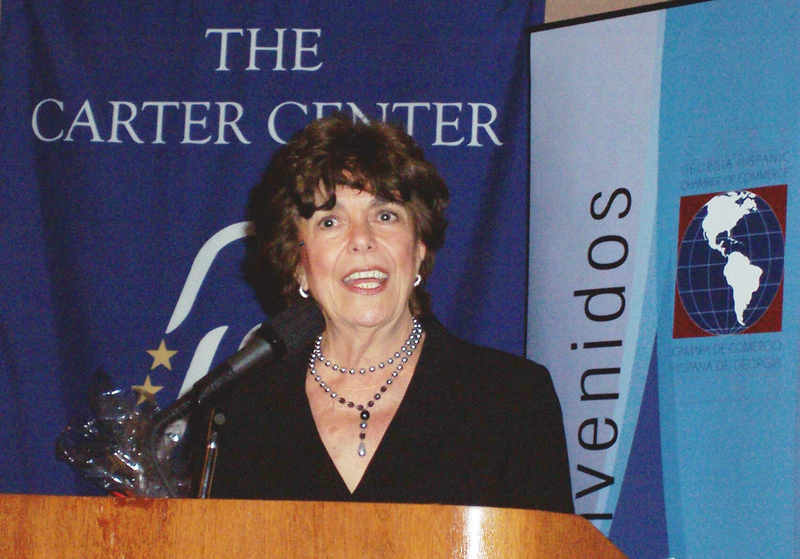 In 2001, she established the Hispanic American Center for Economic Development, which helped foster more than 11,000 new businesses and educated more than 35,000 entrepreneurs through seminars—“helping them achieve the American dream through entrepreneurship,” Whitaker says. Nearly a decade later, more than 10 of these centers were operating across the state. Thanks to her efforts with the park, Whitaker was recently named Georgia’s 2018 Cox Conserves Hero, a 10-year program by Cox Enterprises in partnership with the Trust for Public Land that recognizes those who work hard to preserve and enhance outdoor spaces. “Atlanta’s population is very diverse, and this [park] was a way to honor somebody who really elevated a lot of those communities, not just the Hispanic community,” Whitaker says. To date, she has raised more than $250,000 in private funds to renovate the park, with support from AT&T, real estate developer EDENS, Park Pride, and a number of grants and donations.